Cymbeline is the Alphar’s Incendiary, whose existence is only known to a handful of people. She’s been trained since birth to be the perfect weapon or the perfect assassin. However, when her most recent assignment turns out to be an innocent she decides it’s time to ‘talk’ to the Alphar. Some serious surprises await them both. When the new Alphar Kerrick first meets the woman claiming to be the Incendiary, he realizes he found his mate. 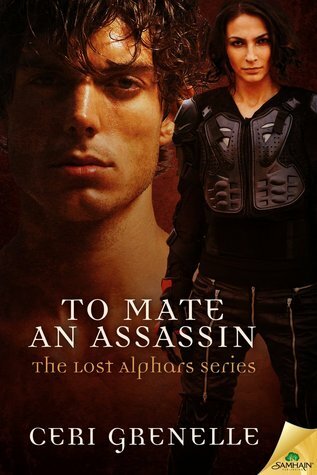 And from there starts a journey, a journey where an Alphar learns to trust his mate and where an assassin learns how to be both herself, a mate, and an assassin. That was the main plot. The secondary plot is heady… a war between two species. And a crazed ancient who will do anything to get what she wants. The secondary plot is all about the Alphar and his responsibility to his people. Cymbeline and Kerrick…their relationship was rocky from the start. Their passion was bright hot sizzling. They had to learn each other and find their place in each other’s lives. For anyone who has read about mates in the paranormal world know that they are possessive and in this case, it’s the same. For me it showed me the realistic side of this romance. You work hard for what you want. I love the writing style of Miss Grenelle. It was detailed albeit a couple of times it felt like she is trying to fit too much into one book. Sometimes it felt a little hurried. However, I loved every bit of reading time I spent on this and I’m looking forward to the next book. Miss Grenelle has given the readers a hint in this book about whose story would be written and whose story we would be reading about. And I would like to say that this will only increase the readers need to get the next book.